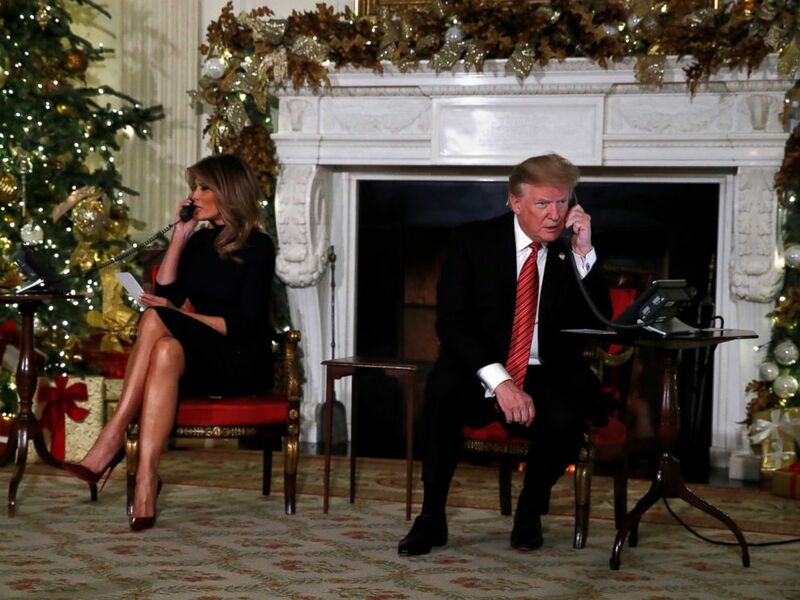 President Donald Trump did the unthinkable while taking a call about Santa on Christmas. 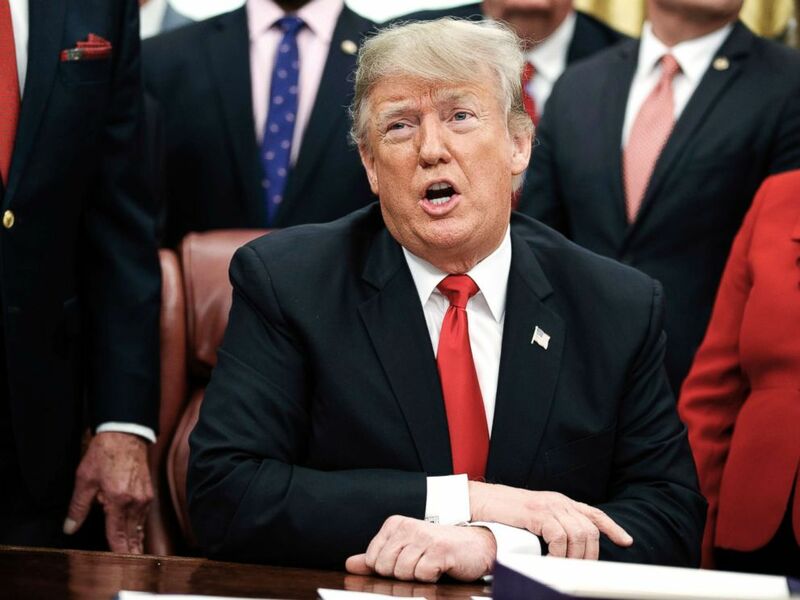 Add Donald Trump to the news The White House State Room is a 7-year-old named Collman if she was "still a believer," possibly shaking the young girl's faith in Saint Nick forever. "Hello, is this Collman? Merry Christmas. How are you?" Trump asked. "Are you still a believer in Santa? Cause at 7 it's marginal, right?" the president added with a chuckle. 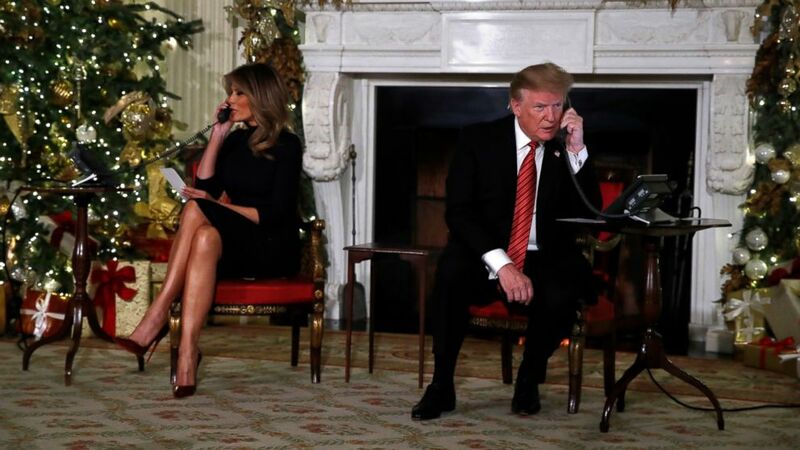 President Donald Trump speaks on the phone sharing updates to track Santa's movements from the North American Aerospace Defense Command (NORAD) Santa Tracker on Christmas Eve, Monday, Dec. 24, 2018. The North American Aerospace Defense Command (NORAD), which has tracked Santa's Christmas Eve trek around the globe for 63 years. Trump may have been in a gloomy mood due to the ongoing government shutdown and the recent stock market selloff, but he appeared cheeky in subsequent calls. Hey what heard laughing, ask kids about their hometowns and then thank you for your service. President of the North American Aerospace Defense Command (NORAD) Santa Tracker on Christmas Eve, Monday, Dec. 24, 2018. President Donald Trump makes a statement on the possible government. 21, 2018, Washington D.C.
"What's Santa going to get you for Christmas? Who's with you?" he asked another young caller. "Have a great Christmas and I'll talk to you again, OK?" First lady Melania Trump wearing a dark-colored suit and red tie. She called the annual event one of her favorite White House traditions. "Helping children across the country track #Santa is becoming one of my favorite traditions," she tweeted. "@Potus and I enjoyed working with @NORADSanta – #ChristmasEve"
NORAD has tracked Santa Claus' sleigh from the North Pole since 1955. The NORAD officer's phone number is in a Christmas ad by mistake. Most government offices were closed due to the shutdown, but NORAD said it would continue the tradition no matter what. "In the event of a government shutdown, NORAD wants to continue with its 63-year tradition of NORAD Tracks Santa on Dec. 24," NORAD tweeted last week. NORAD Tracks are supported by approximately 1,500 volunteers who make the program possible each and every year. "